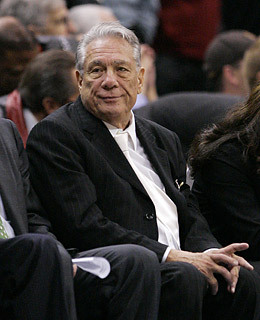 You may have heard the name Donald Sterling recently on social media or a web news source. The married Clippers basketball team owner lit up the internet when his alleged conversation with his girlfriend (not his wife), V. Stiviano, surfaced recently. On the recording – yet to be authenticated – Sterling is heard chastising Stiviano for taking a picture with basketball legend Magic Johnson saying that she can “f*** them” (black people) but just “don’t bring them to [his] games.” What people seem to be missing here though is that Sterling’s words point less to the obvious racial biases of a very wealthy individual and more directly to the vile, invidious form of racism which permeates every institution in this country. In essence, Sterling is a case study in the cancerous institutionalized, systemic racism that even rich bastards like himself have no choice but to answer to. Many people have taken time to respond to Don Sterling including Lebron James (the most eloquent), Al Sharpton (gratuitous), Magic Johnson (who actually got a mention in the recording itself), and Snoop Dogg (my personal favorite). Sadly, they all invariably miss the point that Sterling is making about racism and its linkage to capitalism. Let’s follow the storyline here. Sterling was called on the phone by someone who saw a picture his girlfriend posted on Instagram with Magic Johnson. They were letting him know that she was publicly seen with a person of color. He then let his girlfriend know that he didn’t want her – she who is now being sued by his wife – to be seen in public with black guys like Johnson because she is supposed to be a “delicate white or Latina girl.” And, by posting pictures on Instagram with black people, she is publicly associating with them. Now, this is where most of the responses stop short. But, I posit that there are two facts here that no one seems to be paying any attention to: a) Someone or some people are keeping tabs on this man’s mistress and find her gallivanting about with men of color more egregious than the fact that Sterling is cheating on his wife in the first place and b) Sterling’s primary concern is that he can’t control his dainty side piece’s public identity with lavish trips, houses, and other gifts. This guy is drenched so deeply in heteropatriarchal, male-dominated, capitalistic racism that he can’t seem to understand how a woman of color would want to be seen in public with one of the most well known athletes in the history of breathing. This sicko isn’t driven by racism; he is driven by money. The system of reward and punishment based on one’s tonal merit engulfs him. And, he is keenly aware of the fact that money and race go hand in hand in America. Sterling is an adulterer, a very very rich adulterer. That, too, is a fact which few noted in this conversation. His wife’s focus in the current lawsuit is squarely on his mistress and not him. Why? Because she is likely indoctrinated by the same religion which lifts affluent white males above the law – earthly or otherwise. Mrs. Sterling has also figured out that her ends and social identity are inextricably linked to the dominance of the male identity over personal efficacy. Sterling’s cheating is acceptable because he is rich and white. Boundaries typically assigned to married men simply don’t apply to him because…you know…money. To add, Sterling (allegedly) beckons his girlfriend throughout the recording to do whatever she wants with black people in private (even sleep with them) as long as she doesn’t show that to anyone publicly. Let’s not forget that Sterling believes himself to have dominion over Stiviano’s lady parts granting her permission to use them in private with whomever, whenever. He is disappointed by her assertion that she is mixed – Black and Mexican – letting her know that her public persona as a delicate white or Latina woman trumps her genetic ties. I couldn’t help but think about the recent film Divergent when they repeatedly used the phrase “faction before blood.” Sterling’s words underscored the notion that being seen as white or simply non-black – otherwise known as passing – to white people is one of the most important assets one could possess – DNA be damned. To threaten that is to besmirch one’s own character and jeopardize one’s monetary possibilities simultaneously. He seems almost frustrated that Stiviano can’t get a grasp of this obvious reality. From this recording, we can’t truly know if Sterling is racist. We know that he holds some biases against black people but he likely wouldn’t act on those feelings in any measurable way. Nonetheless, nothing he said here is surprising. His veiled hatred of minorities is the name of the game (no pun intended). The system in which he currently participates is less a land of opportunity and more a plantation-esque redux. This is the main reason why new NBA Commissioner Adam Silver has no plans to take action against Sterling at present. But, we do know one thing for certain – we aren’t post-racial. Sterling is obviously a marionette dancing the ‘jig’ for other whites in power just as we are expected to do. His strings are pulled by that ‘invisible hand’ John Smith taught us all about. This keen puppet master knows that spoon feeding us words like colorblind, post-racism, and class warfare helps mask his dubious presence. He hopes we’ll all take the blue pill and stay in the Matrix so he can cash out on our willful ignorance. Meanwhile, we spend our heard-earned cash subsidizing his hatred for us. The system is brilliant if not implacable. All Sterling did was shine a light on the puppeteer. We can’t see his face yet, but I am guessing he’s a rich white man too. And if we miss this flash of light exposing his position, he’ll just keep laughing at us all the way to the bank.